Farzana Akther is an Assistant professor at the Department of Design and Communications, University of Southern Denmark. She obtained her Ph.D. in ICT and learning at the Department of Communication and Psychology, Aalborg University. Her doctoral thesis examines the ICT appropriation in a community development context in Bangladesh. Her research interest includes the field of ICT for Development, computer supported collaborative learning (CSCL), human-computer interaction (HCI), and design and development of ICT based learning tools. Lone Dirckinck-Holmfeld is professor in ICT and Learning at the Department of Communication and Psychology, Aalborg University. She is former Dean, Faculty of Humanities, Aalborg University (2009 – 2015) and PhD (1990) from Roskilde University. Lone Dirckinck-Holmfeld’s research focus on ICT as a springboard for developing pedagogical, participatory and collaborative learning. She is engaged in ICT4D research and is currently involved in a research capacity program in Africa: Building Stronger Universities supported by DANIDA. Latest book: Dirckinck-Holmfeld, L., Hodgson, V., & McConnell, D. (Eds.) (2012). Exploring the Theory, Pedagogy and Practice of Networked Learning. New York: Springer Science+Business Media, 318 p.
The introduction and implementation of ICT depends not only on technological issues but also on social and institutional factors. 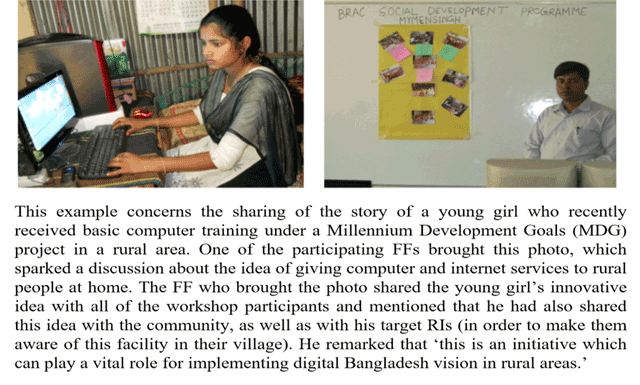 To respond to these challenges, in this article we describe our engagement with an ICT4D research case conducted in collaboration with the Community Empowerment Programme (CEP) of the non-governmental organization (NGO) Bangladesh Rural Advancement Committee (BRAC). The project applies the expansive learning approach in a developing country context, with the aim of achieving ICT skills building in the broadest sense. In this article, we look more closely at one intervention within this research: digital literacy workshops for a sample of CEP field facilitators using ‘photovoice’ techniques. We apply Engeström’s expansive learning framework for ICT intervention on the ground level, showing how intermediary actions and tools can be used in order to create active learning spaces for the community development program’s field facilitators, and we explain how the photovoice technique can be an effective intermediary tool for expansive learning. To reach this conclusion, Nonaka and Takeuchi’s knowledge-creation framework serves as a lens through which to examine the dynamic nature of the knowledge conversion context and its influence on the progression of knowledge. After nearly two decades of discussion on ICT for development (ICT4D), it seems that researchers have still not reached a deep understanding of how to manage and allocate ICT for sustainable rural community development. Although ICT4D research communities are aware of the potential of ICT in their developmental work, the deployment and implementation of ICT still represents an obstacle rather than a tool (Harris, 2016; Heeks, 2006, 2010; Zheng et al., 2018). To date, the vast majority of research on technological changes in community development has provided few details about the ICT integration process (Heeks & Stanforth, 2015). This paper aims to extend the knowledge of how ICT can be integrated in the rural communities in developing countries. The paper builds on the research done on ICT tools as instruments of development processes presented in ‘ICT Appropriation: A Knowledge Creation Perspective’ (Akther, 2015). The field work presented here was conducted in collaboration with the Community Empowerment Programme (CEP) of the largest non-governmental organization (NGO) of Bangladesh, known as BRAC. In this paper, we explain how photovoice-driven digital literacy workshops (DLWs) are staged and investigate how the photovoice technique can be an effective intermediary tool for expansive learning (Engeström, 1987, 2001). This study also reveals how associated intermediary actions and tools are mediated by the context or setting of knowledge creation. To reach this conclusion, we have borrowed Nonaka and Takeuchi’s (1995) knowledge creation framework and Nonaka and Konno’s (1998) concept of ‘Ba’ (meaning ‘place’) to serve as lenses through which the dynamic nature of knowledge conversion context and progress can be captured. In rural areas of Bangladesh, living conditions are characterized by poverty, unemployment, illiteracy, and a lack of access to information. These conditions are being addressed in many ways and at many levels by initiatives introduced by both government and non-governmental organizations. The CEP is one such BRAC initiative and has been established in rural areas for over 19 years (BRAC, 2015; BRAC CEP, 2018). The government of Bangladesh has launched new laws and regulations aimed at improving the benefits of ICT, especially to less privileged communities in rural areas (Access to Information, 2009), and the BRAC wanted to help by activating the existing system for dispatching governmental regulations to rural areas. The research (Akther, 2015) focused on the enhancement of rural community development through ICT and identified the CEP ‘field facilitators’ (FFs), or ‘field workers’ as the key actors of ICT4D within the country. FFs are involved in the community development process as mediators between the government and local residents and contribute to achieving the socio-political and economic empowerment of the less privileged rural populations. Wandering from village to village, they spread messages from the government or NGOs to local villagers using alternative dissemination techniques, such as rural institution-building, workshops, meetings, community radio and popular theater performances (BRAC CEP, 2018). 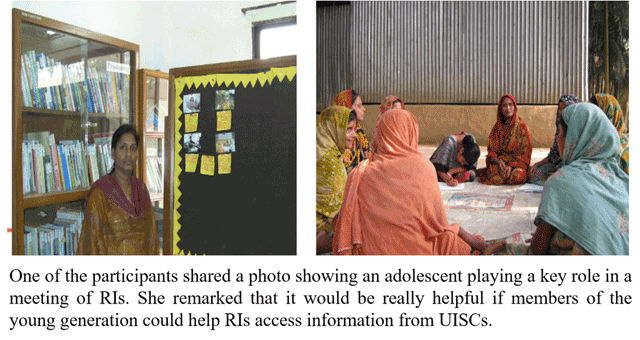 The article focuses on presenting the findings from the empirical research conducted in the form of digital literacy workshops (DLWs) for a sample of FFs where the photovoice technique (Wang & Burrie, 1994, 1997) helped participants articulate their ICT experiences and skills. The photovoice technique is a well-known method in participatory action research and builds on a history of earlier participatory needs assessments in healthcare and social health education (Wang & Burrie, 1997). This technique is used as a research method for enabling community change and helps to improve understanding of the data by helping the participants become more active and engaged and ensuring the engagement of the whole community (Wang, 1999; Wang & Burris, 1994). It also increases back-talk (Schön, 1983) by bringing background knowledge to the fore and allowing more voices to be heard. This research focuses on ICT learning and knowledge creation, inspired by the theory of expansive learning (Engeström, 1987) and Nonaka and Takeuchi’s (1995) knowledge creation theory. Before describing the reasons behind combining these two theories and the benefits that can be gained, we will first provide a brief overview of expansive learning and knowledge creation. Rather than consider all the aspects of these theories, we emphasize the ones that highlight the interrelationships between the intermediary tools and actions and the expansive learning context, as well as those between the intermediary tools and the knowledge conversion setting. According to the activity theory, learning occurs as the interchange between participants and only later at an individual level (Vygotsky, 1978). Engeström (1987) used this axiom as the foundation for his theory of learning as an expansion of activity. The pivotal aim of expansive learning is to produce new forms of activities, as ‘learning is mastery of expansion from actions to a new activity’ (Engeström, 1987: 125). Vygotsky (1978) proposed a methodological principle called ‘double stimulation,’ which enables individuals to jump from learning to development. This concept of formative intervention is completely different from the linear intervention method embedded in the idea of the traditional controlled experiment (Engeström & Sannino, 2010). Double stimulation pushes the subject to reach beyond the initial problem given in order to ascertain the object behind the problem. Vygotsky (1978) gave the subject both a demanding task (first stimulus) and a neutral or ambiguous external artifact (second stimulus), which the subject could fill with meaning and turn into a new mediating sign that would enhance the subject’s actions and possibly lead to the reframing of the task (Engeström & Sannino, 2010). Through these external actions with new societal tools as intermediaries, participants can better absorb social, historical, and cultural knowledge (Engeström, 1987). This process is what Engeström coined ‘expansive learning,’ which involves transforming social practices, beginning by questioning existing practices and discovering and implementing changes for their collective activities (Engeström, 1987, 1999). Figure 1 represents Engeström’s view of expansive learning, which inspired the development of the model used in this study for constructing and resolving successively evolving contradictions. Sequence of epistemic actions in an expansive learning cycle (Adapted from Engeström, 1999: 384). In expansive learning, learners acquire knowledge about something that is not yet present, emphasizing the intense analysis necessary for horizontal movement and hybridization (Engeström & Sannino, 2010). This boundary-crossing process is certainly multi-voiced and multi-scripted, resulting in a transformed activity system (Engeström, 2001). In this research context, it was necessary to examine how FFs are embedded in their relationships with other local and cultural entities. To explore expansive learning as a foundation for change interventions, this research used photovoice-based DLWs, making it possible for complementary and conflicting voices of various groups to be heard. 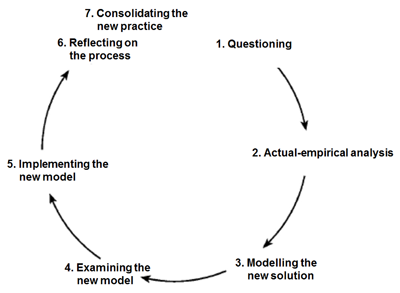 Following the expansive learning model, Figure 2 presents an overview of the learning cycle applied in the research process. In later sections of this paper, examples of the field research activities during Phase 4 are provided, in which the DLWs were conducted with the help of the photovoice technique. The expansive learning cycle applied in this study (adapted from Akther, 2015: 60 & 144). The first two phases of this study sought formulations on the present situation of FF intermediaries, while the third and fourth phases focused on how participants perceived the arrival of ICT as part of their practices. The participants, namely FFs, need practical tools and knowledge to take epistemic action and create new concepts. Hence, this study characterized Phases 1 and 2 as first-order work and Phases 3 and 4 as second-order work, in which the participants took part in ICT skill-building activities and were encouraged to perceive ICT as part of their known practices. Tensions in the form of contradictions, as outcomes from the first two phases, worked as stimuli for knowledge creation in Phases 3 and 4, in which the FFs developed awareness of their challenges and tried to solve them by imagining how ICT could be integrated into their developmental work. As facilitators of the intervention and learning situation, we had some influence in choosing the right intermediary tools depending on the context and setting. 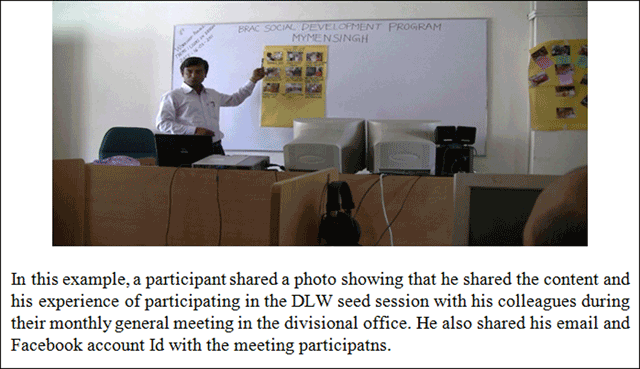 Here, we conducted DLWs using the photovoice technique as an instrument to maximize the participants’ experiences of absorbing social, historical, and cultural knowledge of ICT use, which involved providing a knowledge creation setting for the achievement of expansive learning. The photovoice technique is used as an ‘intermediary tool’ and the workshop sessions are considered ‘remediation actions’ aiming to create knowledge agency in this special context of ICT4D. The change process in an expansive learning cycle initiates a renewal of the existing activity system by solving the existing tensions or contradictions and developing new knowledge and new contradictions (Engeström, 1987). Regarding organizational change, Nonaka and Takeuchi (1995) emphasize that knowledge and skill are considered the most important resources for sustainability. They explain the knowledge creation metaphor for more concrete product development purposes in an organizational setting. We find Nonaka and Takeuchi’s (1995) and Nonaka and Konno’s (1998) metaphors useful for gaining a deeper understanding of the knowledge creation setting and knowledge conversion. By combining Engeström’s (1987) theory of expansive learning with Nonaka and Takeuchi’s (1995) concept of ‘knowledge creation’ and Nonaka and Konno’s (1998) concept of ‘Ba,’ this study aims to explain the relationships between intermediary actions and tools and the participants’ individual knowledge process as well as the social and physical environments (see Figure 3). The purpose of this analysis is to confirm the importance of choosing the appropriate intermediary tools and actions that enable expansive learning to take place. Conceptual model for ICT appropriation through knowledge creation (Akther, 2015: 67). Nonaka and his colleagues asserted that knowledge is created through a cycle of continuous interaction between tacit and explicit knowledge, thereby enabling the creation of new knowledge involving four modes of knowledge conversion: Socialization (from tacit to tacit), Externalization (from tacit to explicit), Combination (from explicit to explicit), and Internalization (from explicit to tacit) (SECI) (Nonaka, 1994; Nonaka & Takeuchi, 1995). Nonaka and Takeuchi’s fundamental assumption, which comprises the core of the SECI model, is that tacit and explicit knowledge are two complementary forms of knowledge in continuous interaction. The concept of ‘Ba’ (meaning ‘place’) refers to the shared context of knowledge creation; it can be a physical space (e.g. office), a mental space (e.g. shared experiences and ideas), or a virtual space (e.g. email, Facebook). Nonaka and Konno (1998: 41) stated that ‘Ba is the world where the individual identifies himself as part of the environment on which his life depends.’ Here, the concept of ‘Ba’ does not necessarily refer to a physical space but to a specific time and space. These ideas exist in the same family of concepts as those found in Suchman’s (1987) work. Suchman (1987) stated that knowledge creation is not context-free; rather, it is situational. In the same vein, Nonaka et al. (2008: 8) argued that ‘the knowledge-creating process is necessarily context-specific in terms of who participates and how they participate.’ Hence, in our research, we applied the SECI matrix and the concept of ‘Ba’ to analyze the participants’ knowledge transformation in photovoice-based DLWs and the environment in which FFs’ role as intermediaries exists. The aim of the BRAC CEP strategy is to inspire broad rural community empowerment by improving the dialogue between and participation of various levels of stakeholders who are geographically distributed in rural areas. Approximately 12,000 community-based rural institutions (RIs), with an average of 40–60 members each, have been established since 1998 (BRAC, 2015). RIs work as organizations that provide help to access information and apply that information to the livelihood practices of rural people (BRAC, 2015; BRAC CEP, 2018). The general aim of the RIs is to mobilize disadvantaged rural groups (especially women), connect communities, and promote the practice of active citizenship. FFs, comprised mostly of young women who have a bachelor’s degree or a similar level of education, are directly involved in community development. Both levels of FFs (i.e. subdistrict-level FFs, and district-level FFs) interact directly with the respective RIs of their own subdistricts and different CEP stakeholders (e.g. healthcare specialists, educational advisers and lawyers), including local government agencies and NGOs. Figure 4 represents a wide range of information resources and stakeholders with which FFs are involved in order to accelerate their information exchange and knowledge-sharing activities. Field facilitators’ embeddedness in different information resources (adapted from Akther, 2015: 138). Most FFs did not have a strong background in IT; however, a few had basic computer and internet usage skills. Some had received very basic training in Microsoft Office, but were not confident in their abilities due to lack of use, and availability of technologies. The DLWs were conducted with a sample of FFs. A sample of telecenter entrepreneurs from the governmentally implemented telecenters known as Union Information and Service Centers (UISCs; now known as Union Digital Centers) also participated in the workshops (Akther, 2015). The FFs and the telecenter entrepreneurs were brought together in order to explore whether they could establish a common ground for expansive learning and support each other in their shared efforts to improve rural community development. The Bangladesh government’s ‘Vision 2021’ plan was the driving force behind the establishment of 4,501 UISCs—one type of ‘telecenter model’—in every last tier of the administrative machine (known as Union) to serve its rural citizens. (Access to Information, 2009). It therefore makes sense to explore the possibility of using this Union-based infrastructure to support the work of the FFs. Telecenters – despite the different models and names – share a common definition: ‘a physical space that provides public space and public access to ICT for educational, personal, social and economic development’ (Gomez, Hunt, & Lamoureaux, 1999, p. 17). Two-fold ICT literacy workshops were designed for eight district-level FFs and eight subdistrict-level FFs through close collaboration with the CEP coordinator. Firstly, the workshop sessions were organized for the district-level FFs (district managers) on the use of basic computer programs (e.g. Microsoft Word, Excel, and PowerPoint) and social network tools (e.g. Facebook and the Google group). Secondly, the workshop sessions were organized with the eight subdistrict-level FFs, where each FF collaborated with entrepreneurs of two UISCs in their respective sub-districts of the Mymensingh District. 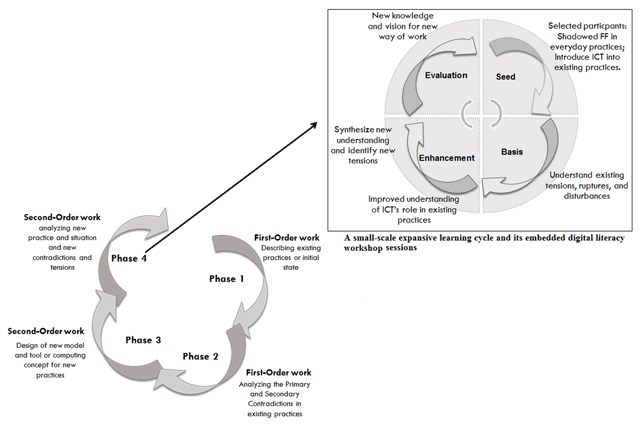 A small-scale expansive learning cycle was applied to organize the activities of four workshop sessions, as shown in Figure 2. A summary of the workshop activities with sub-district level FFs and the aligned expansive learning cycles with the ICT literacy workshops episodes are depicted in Table 1. The photovoice technique was employed as a tool through which the participants could easily articulate their experiences and skills. This technique also helped participants to frame a space for reflection and conversation to envision a future with an improved understanding of shared ICT skills. An analysis of these four DLW sessions is presented in Section 4 with the help of Nonaka and Takeuchi’s knowledge creation framework and Nonaka and Konno’s (1998) concepts of ‘Ba’ for examining the dynamic nature of the knowledge creation context. A small-scale expansive learning cycle and its embedded ICT literacy workshop sessions. Action 1: Informal group meetings with eight FFs regarding UISCs. Action 2: Simple training in the use of digital cameras. Action 3: Each FF collaborates with two tele-centers’ entrepreneurs over 6 weekdays, taking notes and pictures. Various data collection methods were followed during the DLW sessions, such as spot interviews and group discussions, storytelling, participant observation, video-recording of the majority of the DLW sessions and semi-structured audio interviews with each participant during the final session (Blomberg et al., 1993; Greenbaum & Kyng, 1991). The first author’s role was as a DLW facilitator. The spot interviews and group discussions were conducted during the workshop session in order to extract and clarify detailed information that was not directly observable, such as feelings, intentions and missing information. Also, the first author shadowed one of the FF participants during the visit of her UISC in the Seed session of the DLW. This research conducted under the auspices of the faculty of Humanities at Aalborg University complies with the Danish Code of Conduct for research, the European Code of Conduct for Research Integrity, in addition to other various rules of ethical scientific practice (Bryman, 2016). In order to consider ethical issues around using the photos in this research, we obtained the oral consent of each participant prior to the workshop sessions, and written consent was obtained from BRAC’s higher authority for conducting digital literacy workshops. All field facilitators were instructed to respect cultural sensitivities and privacy while using the digital camera during the Seed session of the workshop. They were also instructed to obtain only oral consent from the individuals who would appear in their collected picture. Marshall (2003, p. 275) suggested that “Judgments about whether or not to seek written or verbal consent should be based on the nature of the research, the context of the study, and the seriousness of the risks involved for participants in signing an informed consent document” (2003, p. 275). He also reminded us that written consent may sometimes be particularly problematic because of the nature of the study, illiteracy, or the social vulnerability of the participants (Marshall 2003, p. 272). In this research, we analyzed the workshop process from the perspective of expansive learning (Engeström, 1987). Figure 2 (inserted figure) describes the different steps used in the expansive learning cycle to design and analyze actions based on DLW activities. Following this, a deductive process (Wilson & Chaddha, 2009) was used to analyze the data from the DLWs, whereby the conceptual framework of Nonaka and Takeuchie’s (1995) – described in section 2 – were based on ethnography data and photovoices. In this section, we analyze the four DLW sessions using the four modes of Nonaka and Takeuchi’s (1995) knowledge conversion model (as discussed in Section 2). The knowledge creation map is depicted in Figure 5. We also look into the concept of Ba (section 4.1), the role of the photovoice technique in the knowledge creation process of inter-subjectivity and trans-subjectivity (4.2), and the process of self-transformation (4.3). Knowledge creation map of the DLWs sessions. In the DLW Seed session, each participating FF collaborated with the entrepreneurs in the UISCs of their respective subdistricts. All participants were equipped with a digital camera and instructed to respect cultural sensitivities and privacy while using the camera. The FFs spent a considerable amount of time with the entrepreneurs and tried to access tacit knowledge through shared, informal observation and discussion This boundary-crossing activity offered a platform for socialization, in which an individual shares feelings, emotions, experiences, or beliefs with others. As Nonaka, Toyama, and Konno (2000: 9) stated, ‘since tacit knowledge is difficult to formalize and often time- and space-specific, tacit knowledge can be acquired only through shared experience, such as spending time together or living in the same environment.’ The FFs attempted to relate the needs of RIs to the ICT facilities of the telecenters. Their new knowledge about these shared ICT facilities enabled the FFs to innovate ideas about working with information in rural communities. This was discovered through an examination of the FFs’ ethnographic work, which included the photos they collected and selected during the workshop sessions Basis and Enhancement (see below for a sample of photovoices; see also Akther, 2015: 190). In the Basis session, individual FFs presented their tacit knowledge to other participants by crystallizing their ideas into stories and words with the help of the photos and notes they had collected during the Seed session. This process helped them externalize and exchange knowledge and learn from each other. Failure to externalize personal knowledge can lead to ontological problems and misunderstandings, as the whole complexity of a given phenomenon may remain undiscovered (Nonaka & Toyama, 2003). In this session, externalization took place where tacit knowledge was explicitly shared using the photovoice technique and dialogue, in which the processes of reflection are in accordance and stimulated. This was apparent from their individual poster presentation work based on the photos they had collected. For example, Photovoices 1, 3, 4 and 5 focus on the close relationship between the skills and needs of the RIs. Although this did not directly contribute to the development of a shared concept among the FFs, it represented the differences and similarities between their views. Sharing an innovative story about ICT implementation in rural areas. Sharing ICT knowledge among different levels of stakeholders of community development activities. Highlighting UISC usefulness and gender issues in ICT implementation in rural areas. Younger generation support is vital in rural areas. Sharing ICT knowledge at the intra-organizational level. In the Enhancement session of the workshop, participants were expected to describe the functions of the shared technology centers in order to investigate and challenge their understanding. Both novice and experienced FFs took part. They did not all have the same opportunities to collaborate with UISC’s entrepreneurs and they had varying ICT skill levels. Thus, unlike the Seed and Basis workshop session, this Enhancement session focused on minimizing the knowledge gaps among FFs. Two groups were formed and given one-and-a-half hours to prepare a poster with the help of their collected photos and notes. Each group was asked to work together and present their accumulated explicit knowledge with the other groups, while the photographs depicting their normal activities served as anchor points on which they gradually built up their understanding of ICT. This constituted the knowledge conversion mode of combination (i.e. explicit knowledge to explicit knowledge). In addition to blending the varying levels of ICT skills amongst the FFs, it was also necessary to synthesize the FFs’ capacity for sharing information with all RIs and the UISC’s entrepreneurs’ constraint with regard to sharing the ICT-enhanced information with the RIs. According to Nonaka & Toyama (2003), synthesis is not a compromise; rather, it is the integration of opposing aspects through a dynamic process of dialogue and practices. This view can be considered as an example of a tertiary contradiction (Engeström, 1987). The photovoice mapping technique proved to be a powerful tool for the synthetization of knowledge during this session. Pictures 1 and 2 below show their mutual discussion and group work, and their use of photos. 1 and 2 show the FFs’ group work during the Enhancement session and 3 shows one FF presenting her work during the Evaluation session. In the Evaluation session, each participant created individual flashcards (two different colors) considering two perspectives: i) Shared ICT centers as an object of field facilitators’ ICT learning and, ii) Shared ICT centers as tools for community development practice. Through this activity, they consolidated their insights on how they could implement this knowledge of ICT in their own practices. Each participant’s experiences of the DLWs were explored in a semi-structured interview at the end of this session. We can therefore consider this step as a form of internalization, in which the individual translates the shared explicit knowledge to their own practices. (For a detailed overview, see Akther, 2015: 150). This section describes how the notion of the knowledge creation context ‘Ba’ serves as a means for understanding the potential of the workshop process and for intensifying the knowledge creation dynamics. Here, we analyze the context of the first DLW session, Seed. After completing the first activity for this phase, as explained in Table 1, all the participants were equipped with a digital camera and returned to their field activities for one week (i.e. six working days). All the FFs collaborated with two telecenter entrepreneurs for a considerable amount of time in their respective subdistricts. This collaboration invoked a context in which the FFs, together with the telecenter entrepreneurs, stepped outside their usual methods and attempted to acquire new knowledge about shared ICT. This collaboration offered a platform for ‘originating Ba’ (Nonaka & Konno, 1998), one in which the FFs’ ICT knowledge began to be developed through face-to-face experiences with the telecenter entrepreneurs and its ICT instruments, e.g. computer, printers, photocopier, USB modem for Internet connection, alternative electrical devices in case of disrupted power supply, different e-governance service catalogs, posters and basic computer training materials. As the phenomenological method of ‘letting the reality emerge’ often plays a vital role in the creation of new knowledge (Nonaka, Toyama, & Scharmer, 2001), the Seed phase was not limited within the boundaries of one activity; rather, the sessions of mutual interaction with entrepreneurs merged into the participants’ usual activities during the working week and were considered part of the FFs’ resource organization visit work. Thus, this episode resulted in various platforms for knowledge creation through the ‘interacting Ba’ within various organizational boundaries and rural community groups as well as among the FFs. ‘Interacting Ba’ describes the place where tacit knowledge is shared through explicit means, such as creating dialogue, presenting leaflets or posters, and writing on a whiteboard, which is the key process in externalization. The open links between shared places, such as RI meetings (see Photovoices 1 and 6) and workshops with multiple stakeholders and inter-organizational meetings as well as formal and informal communication with different inter/intra-organizational personnel during the stipulated time (see Photovoices 2 and 5), created the tendency for FFs to interact in innovative ways with their community because of their newly gained knowledge about shared ICT. Hence, ‘originating Ba’ provided the energy, quality, and place for an individual’s tacit and explicit knowledge about ICT to develop. Organizational knowledge creation should be understood in terms of a process, one that amplifies the knowledge created by individuals and crystallizes it as part of an organization’s knowledge network (Nonaka, 1994: 17). In this study, this was facilitated by the FFs’ existing knowledge-sharing dimensions and the knowledge conversions that emerged through their participation in various interacting activities. Figure 6 depicts how the FFs’ knowledge-sharing was synergistically networked in the Seed phase and how the contexts at play existed on many ontological levels, forming an interwoven, greater Ba (Nonaka & Konno, 1998; Nonaka et al., 2000) (For detail see Akther, 2015: 181). A greater Ba of ICT knowledge creation (Akther 2015: 181). Through this mutual learning (between the FFs and the entrepreneurs), the Seed phase invoked a greater space for ICT knowledge creation using the FFs’ existing intermediary actions and tools, in which knowledge was created, shared, and utilized. This interwoven Ba is not only nurtured by a structural opportunity for knowledge sharing, it must also be supported by relational and trustful sharing (Nonaka et al., 2000). The FFs’ cognitive, relational, and cultural abilities regarding different information domains and sources create the spiritual and relational contexts through which they can share their tacit knowledge with stakeholders and their respective RIs. The workshops confirmed the explanatory power of the photovoice technique (Wang, 1999), illustrating different situations or events found in the participants’ daily practices. This technique helped the participants share their experiences, as their photos depicted the different aspects of the challenges they faced and their individual posters – shown in photovoice examples – illustrated their different approaches. At the beginning, what was notable was how difficult it was for the participants to explain in detail their work processes, concepts or challenges. However, when they were asked questions about their photos, such as ‘What is the context of the event in this photo?’ or ‘Why did you do this?’ the participants used the pictures to reflect upon their own views and to share their views with others, thereby achieving trans-subjectivity. For example, during the Enhancement DLW session, one participant – referring to one specific picture – claimed that when she visited this governmental organization, it was very difficult for her to get complete information or any authentic documentation on certain issues. Another participant suggested that she could help her because of her long-time relationship with those organizations. Dialogue among participants with different viewpoints is essential in order to create a meaningful ‘ba’ (Nonaka et al., 2000). A good Ba allows a participant to see things from a perspective that is deeply rooted in his or her own beliefs and values, while simultaneously seeing the situation from the perspective of others. Each participant had a unique role; for example, those who brought photos from certain events acted as the inventors of their events, since they already knew the background of the shared realities. Other participants played an inter-subjectivity role (Varela & Shear, 1999) by interacting with the inventors, thereby enabling the participants to get a sense of the differences in perspective. These photovoice-based workshop sessions allowed the participants to hold viewpoints of both existing and future practices at the same time. The groupwork in the Enhancement session, with the help of the photovoice technique, focused on stimulating dialogues related to the participants’ experience-based knowledge, which was not directly observable. This is in line with findings by other participatory design researchers; for example, Elovaara et al. (2006) noted that experience-based knowledge and knowing are not directly observable, and Mörtberg and Studedahl (2005) emphasized that skillful techniques are needed to develop and illustrate ideas through the creation of tangible things. In this study, the participants’ photo collections operated as tangible things to illustrate their experience-based knowledge. At the individual level, this may lead to self-transcendence (Nonaka & Konno, 1998). It can be illustrated from a FF’s remark during the Evaluation session of the DLW: ‘It was really challenging to explain to you and my colleagues our activities and challenges, but the pictures helped us to present to you the real scenario of our work and challenges’ (DLW-FF-5). Photovoice became a shared context that reduced the participant’s concern about sharing knowledge and ideas that were no longer tacit. Self-transcendence is fundamental to sharing tacit knowledge (Nonaka & Konno, 1998). As such, the DLW was an example of meaningful ‘Ba’ at work. This paper presented an analysis of digital literacy workshops in the context of ICT4D research. We designed the workshop settings with the aim of introducing ICT into the FFs’ activity,’ so that the outcome would be the participants’ understanding of the potential role of ICTs within the contexts of their own practices. 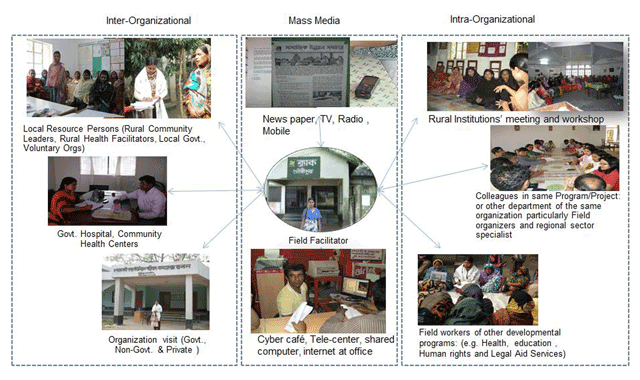 The small-scale ICT knowledge creation cycle of this DLW illustrates a sample of instruments or enablers for knowledge creation, such as greater contextualization using the photovoice technique, mutual collaborations between the FFs and the telecenter entrepreneurs, and the FFs’ existing intermediary actions and tools. Building on Engeström’s (1987) theory of expansive learning, we investigated each workshop phase within the context of its developmental organization. We also borrowed from Nonaka and Takeuchi’s (1995) model of knowledge conversion model (i.e. the SECI matrix) and Nonaka and Konno’s (1998) concept of setting ‘Ba’ to explain the relationships between individuals and their social and physical environments during the DLW activities. Our analyses documented how ICT implementation settings and their enablers (i.e. the photovoice technique and workshop sessions) create dynamic knowledge about ICT and promote the use of ICT among FFs. These results confirm that the foundation of Nonaka and Takeuchi’s (1995) knowledge creation model also can provide insights in a developmental context, such as Bangladesh. The DLWs and the photovoice technique also qualify and concretize the work with the concept of expansive learning, thereby providing a shared space (‘Ba’) to reflect on and critically discuss the new work conditions and information practices of the FFs. The focus on how to provide for the self-transcendence of the individual participants is a particularly important contribution to the overall idea of expansive learning. The photovoice technique, modified by Akther (2015), worked extremely well in helping the participants articulate their experiences and skills so that they were clear to both the speakers and their peers. Using the photovoice technique, ICT knowledge can cross both individual and organizational boundaries, opening a participatory design venue to create agency and draw in diverse stakeholders. The photovoice technique may generate multi-voiceness and serve as an intermediary tool for boundary-crossing. The photovoice technique can support self-transcendence and can become an intermediary tool for establishing a common ground and engagement for expansive learning. Access to Information. (2009). Digital Bangladesh: Concept Note. Access to Information Programme, Prime Minister’s Office. Retrieved from: http://www.a2i.gov.bd/sites/default/files/resource_docs/Digital%20Bangladesh%20Concept%20Note_Final.pdf. Akther, F. (2015). ICT Appropriation: A Knowledge Creation Perspective, A Case Study of Rural Community Capacity Building in Bangladesh. PhD Thesis, Aalborg University. Blomberg, J., Giacomi, J., Mosher, A., & Swenton-Wall, P. (1993). Ethnographic field methods and their relation to design. In: Schuler, D., & Namioka, A. (eds. ), Participatory design: Principles and practices, 123–155. Hillsdale, NJ, USA: Erlbaum. BRAC. (2015). BRAC Annual report 2015. Bangladesh Rural Advancement Committee. Available at: http://www.brac.net/images/reports/BRAC-Bangladesh-Report-2015.pdf [Accessed 12 September 2017]. BRAC CEP. (2018). Bangladesh: Community Empowerment Programme. BRAC. Available at: http://www.brac.net/cep [Accessed 10 January 2018]. Bryman, A. (2016). Social research methods (Fifth Edition). Oxford; New York: Oxford University Press. Gomez, R., Hunt, P., & Lamoureux, E. (1999). Telecentre Evaluation and Research: A Global Perspective. In: Gomez, R., & Hunt, P. (eds. ), Telecentre Evaluation: A Global Perspective, 13–29. Ottawa: IDRC. Greenbaum, J., & Kyng, M. (eds.) (1991). Design at work: Cooperative design of computer systems. Hillsdale, NJ: Lawrence Erlbaum Associates. Nonaka, I., Toyama, R., & Scharmer, O. (2001). Building Ba to Enhance Knowledge Creation and Innovation at Large Firms. Dialog On Leadership, 1–12. Retrieved from: http://www.iwp.jku.at/born/mpwfst/02/www.dialogonleadership.org/Nonaka_et_al.html. Suchman, L. (1987). Plans and Situated Actions: The Problem of Human-Machine Communication. New York: Cambridge University Press. Varela, F. J., & Shear, J. (eds.) (1999). The view from within: First-person approaches to the study of consciousness. Bowling Green, OH: Imprint Academic.